Dennis Smith Has Tooth Knocked Out, Gets Replacement "For The Ladies"
"When there’s ladies lookin’, I gotta be lookin’ nice." 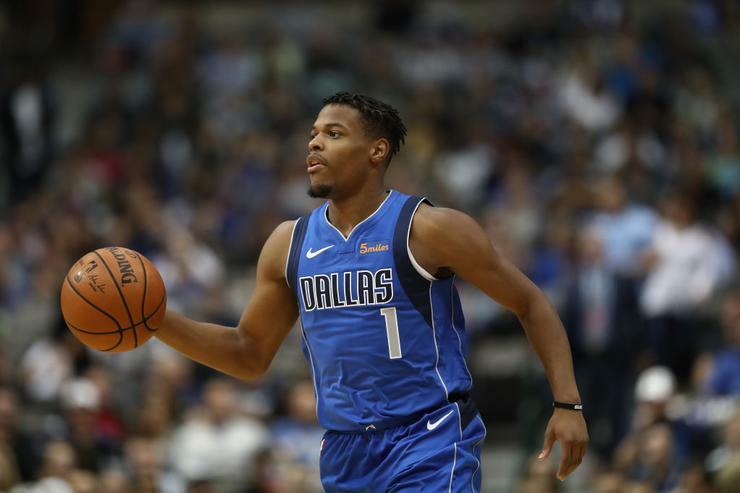 Dallas Mavericks point guard Dennis Smith Jr. lost a tooth during Sunday's game against the Los Angeles Clippers, but that didn't prevent him from making a key play late in the game to secure the Mavs' 114-110 victory. And it certainly didn't stop him from lookin' nice for the ladies during his post-game interview. More on that later. As seen in the video embedded below, Smith lost one of his front teeth when he and Patrick Beverley collided while scrambling for a loose ball in the third quarter. Smith finished with just nine points and five assists but he did come up with a crucial block against Tobias Harris in the final seconds of the fourth quarter as the Clippers looked to tie the game. On top of that, he buried the ensuing free throws to ice the game. The 21-year old point guard has a dentist appointment scheduled for Monday, but he had a temporary replacement ready for his post-game interview. As he explained during the post-game, he couldn't risk looking like a fool on social media, especially "when there's ladies lookin'." "I'm fooling y'all right now," said Smith, per ESPN. "I knew there was going to be cameras. Whenever there's cameras, then it's going to social media. Whenever it's social media, then there's ladies lookin'. When there's ladies lookin', I gotta be lookin' nice. I had to fool y'all right now." The Mavericks, 11-10, will host the Portland Trail Blazers on Tuesday night.